Lucky for me, when I'm too lazy to get off the couch and shop for workout gear (there is some kind of irony in all of this), there is a solution. Enter, the namast'eh box. As a self-proclaimed lover of things made in Canada (how many things can you self-proclaim? Is there a limit? Am I close to it?) this made-in-Canada-featuring-Canadian-brands subscription box, well, checks all of my boxes. Here's a quick break down of this new subscription service--and it's simple! Once you're on the namast'eh site, you choose your subscription package. Choose the monthly plan, an individual box, or prepay for a subscription (Christmas is coming!). After you've selected your plan, you will complete your profile which shares your size and tells the curators about your favourite activities to ensure the outfit you're receiving in your box is hand-picked to meet your needs from that month's featured Canadian brand. Next? Wait by your mailbox because your new outfit is on the way! Each month the namast'eh box features a unique Canadian brand. This is honestly what I love so much about this company. Headquartered in Ontario, sharing the love for Canadian brands from across the country. Each box includes 2-3 pieces of premium yoga and athletic wear in your size to match the activities you love to do. The minimum value of each box is $125! I received the October box, which was also the first box, and it featured Ontario brand Loko Sport. In my box I received the comfiest pair of leggings and a matching tank. My exercise of choice is yoga so my pieces were curated to fit my interests. I also really love to sit on the couch and binge watch Netflix so December's box is right up my alley! The quality of the leggings is comparable to Lululemon. They fit in all the right places, they have a nice high waist and the material is breathable and super flattering. Which leads me to share this! 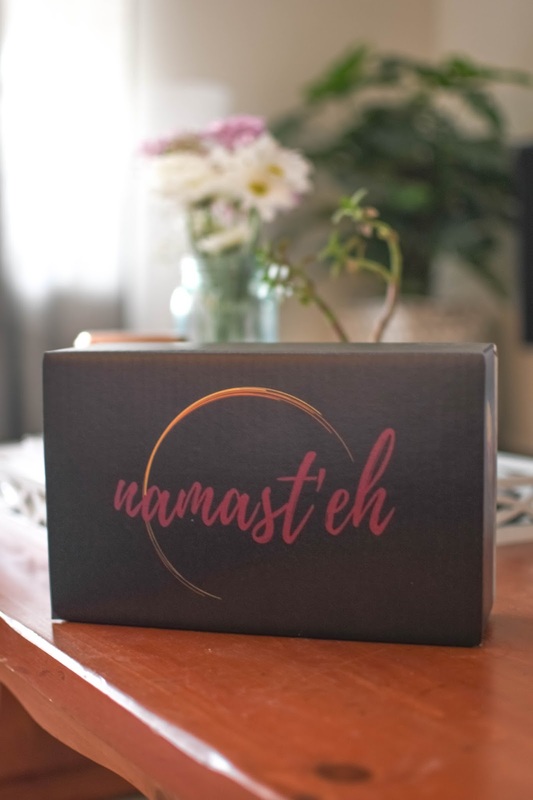 If you're interested in trying out the namast'eh subscription box, I've got a deal for you. Use code NBWES10 at checkout and save 10% off your first box. December's box looks amazing. It features a hoodie, tank and a pair of joggers from Campton Clothing. That Slay hoodie? Yes please! I need it. Remember how I said this box would also match my interests for sitting on the couch and binge watching Netflix? The December box is available until November 15th and ships at the beginning of the month! This would be a great Christmas gift for a lover of anything cozy and cute. There you have it, friends! This new subscription service has a whole lot to love. Made in Canada featuring Canadians. What's not to love? Give it a try and let me know what you think! Thank you to namast'eh box for providing me with a box in exchange for my honest opinion. All opinions expressed are my own. This place is a very nice place for a wedding and worth looking into. While I didn't have my own wedding here, I've seen the NYC wedding venues in all their decked out glory. On a smaller scale, we had our prom there. This truly is a beautiful building with fabulous views.